There are few men better placed to measure the impact of historic encounters between Hibernian and Hearts over the years than Easter Road icon Jimmy O’Rourke. The 66-year-old, a legend of Hibs and fanatic boyhood supporter, netted twice on 1 January, 1973, as Hibs crushed their rivals 7-0 at Tynecastle. He scored the opening goal past a despairing Kenny Garland. The Hearts goalkeeper’s afternoon would get much worse, unlike that of O’Rourke, who would go on to register the sixth goal in Gorgie. The interminable rivalry between the proud capital clubs so often descends into a churlish game of top trumps. Hibs will laud their status as Scotland’s maiden European representatives, before Hearts’ can point to a bulging cabinet of eight Scottish Cups – five of which won while their city foes endure a “big cup” drought stretching back to 1902, including last season’s 5-1 rout of Hibs. A Hibee could throw the 6-2 triumph of 2000 into the debate, only for it to be dismissed by the 22-game unbeaten derby-match sequence achieved by Hearts between 1989 and 1994. O’Rourke, though, was the protagonist in the game which was the trump card for Hibs for so long. “I was fortunate enough to be in a terrific group of guys, and the result against Hearts was the icing on the cake for a terrific period at the club,” the man who also scored in the League Cup triumph over Celtic in 1972 recalled. “I’ll never forget the dates. I made my debut for the Hibs on 9 December, 1962 against Utrecht. I played in the winning team at Hampden in the League Cup final [defeating Celtic 2-1] on the same day in 1972 – 10 years later exactly – and scored a goal. Within three weeks we had beaten Hearts 7-0. You can never forget that. Our squad was incredible, players like Jim Herriot, John Brownlie, John Blackley and Pat Stanton. They were all capped for Scotland. In the build-up to the Scottish Cup final between the sides, which was the first time such an occasion had transpired in 116 years, a never-ending succession of supporters and former players took turns to assert the importance of the encounter as Year Zero in the rivalry. One match to end them all. It is always darkest, however, before dawn, and after the devastation of Hampden in May, there are cracks of sunshine on Leith this season. Pat Fenlon’s rebuilt side sit second in the Scottish Premier League, having replaced the powderpuff stop-gaps of last season with a solid spine this term. Indeed, for a fleeting few hours, Hibs were top of the league following a 3-0 win over Dundee. On 2 January, 2013, Hibs travel to Tynecastle, 40 years almost to the day, since their most famous Edinburgh derby triumph. 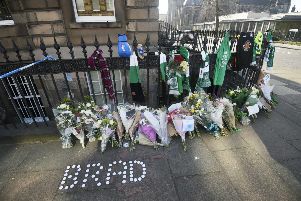 In the eyes of Hibs fans, it would be a fitting time to register a first win over Hearts since May 2009, and restore some more pride after last season’s cup battering. • Jimmy O’Rourke was speaking at the launch of ‘The Game on New Year’s Day’, by Ted Brack and published by Black and White Publishing. The book is available now, priced at £15.99.